Social exclusion is a key issue in Europe's social policy. Both the European Horizon 2020 strategy and the Digital Single Market strategy for Europe aim to support disengaged and disadvantaged learners, enhancing their employability and integration into society. These learners include children in danger of social exclusion, who show few or no signs of empathy and high levels of aggressive or anti-social behaviours. 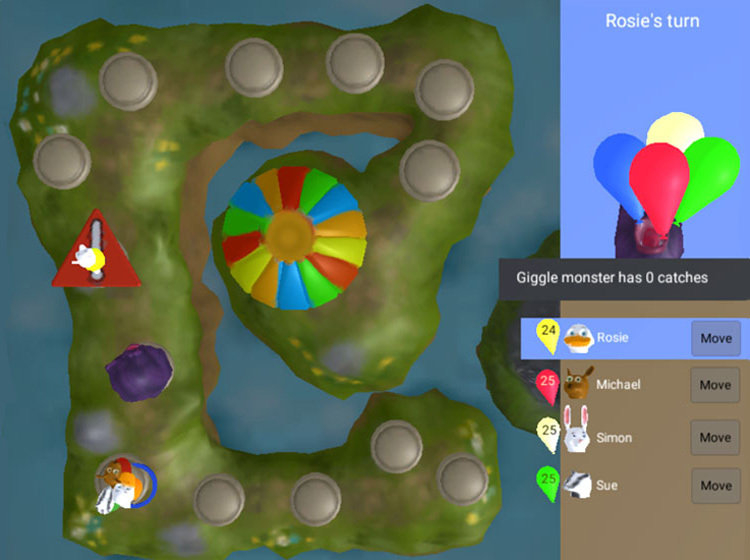 The ProsocialLearn project created a suite of games and an educational game ecosystem tailored to teach children "Prosocial Skills" (including those for friendship; dealing with feelings and skills for collaboration) that can both help them achieve academically and also equip them for better social interaction in later life. All the actors (game industry, technology providers, budget holders, teachers and students) have tailored access to a unified platform providing all the services they need. Access to game industry lead on-line prosocial learning games with unique emotion sensing technologies. Technical APIs to support prosocial game development. A game deployment infrastructure for staging and production release scenarios. Support for teaching communities to explore and share prosocial teaching materials based on ProsocialLearn games. A key challenge in the project was assessing prosociality and defining objectives for the children’s participation. ProscialLearn complements the data gathered through the in-game actions with profiling information and observation analysis of the actual way of playing (e.g. voice or facial expression) with the final goal of inferring the emotional state of the child. Design, development and evaluation of prosocial games. Leadership in the design of the platform architecture and user modelling. Definition of key conceptual and technical models support prosocial learning. Design & implementation of a ProsocialLearn specification language & API for game developers. The implementation of voice based emotion classifier service. Oversight of ethics and steering as part of the Ethics Advisory Board. ProsocialLearn has developed a platform where game developers can make prosocial games available to teachers to include in their lessons. 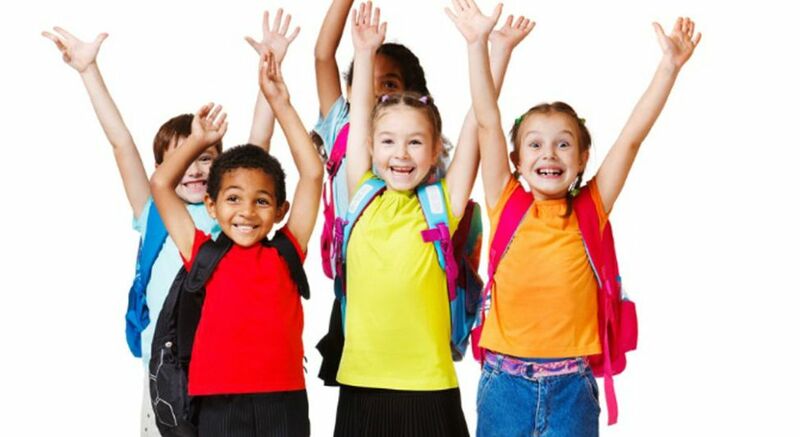 Six games have been developed and evaluated in UK, Spanish, Italian and Greek schools. 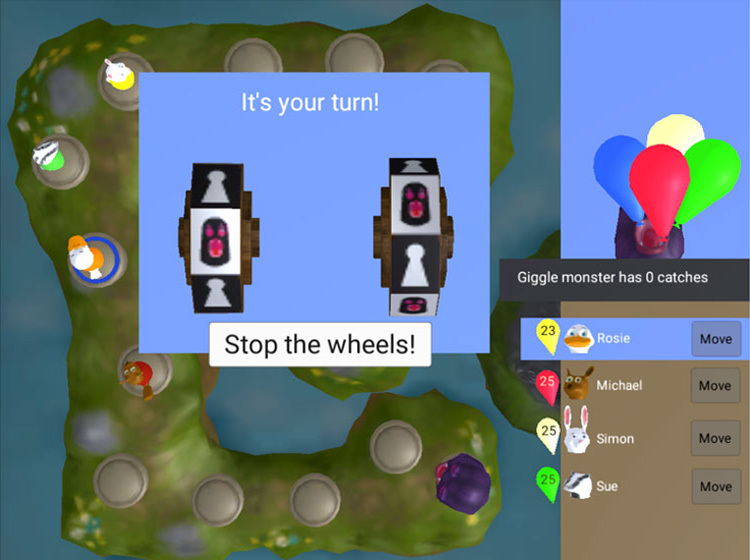 The games capture information about prosocial skills that the students demonstrate (or not), as well as emotional state of the students via voice and audio data. Teachers can view information via the platform after a lesson or in real-time, helping identify opportunities for engagement with the students. Collaborate to escape the 'Giggle Monster'! IT Innovation have developed a prosocial game called "The Chase". 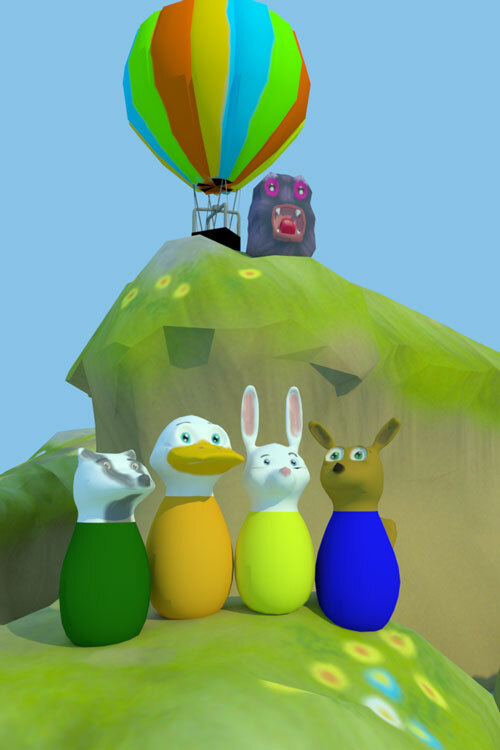 With your friends, you have to escape the 'Giggle Monster' and chase up the hill to escape in a hot air balloon. You need to bring balloons to fill up the hot air balloon and have to collaborate with your friends to help each other from being caught by the Giggle Monster who loves to eat balloons. Our evaluations of The Chase game in both Italian and UK schools have resulted in very positive responses from both students and teachers. In addition to demonstrating the application of learning positive social skills in a games based, pedagogical setting, our trials have also generated an important scientific data set that is being used the development of our voice based emotion classification service. You can read more about The Chase game here. 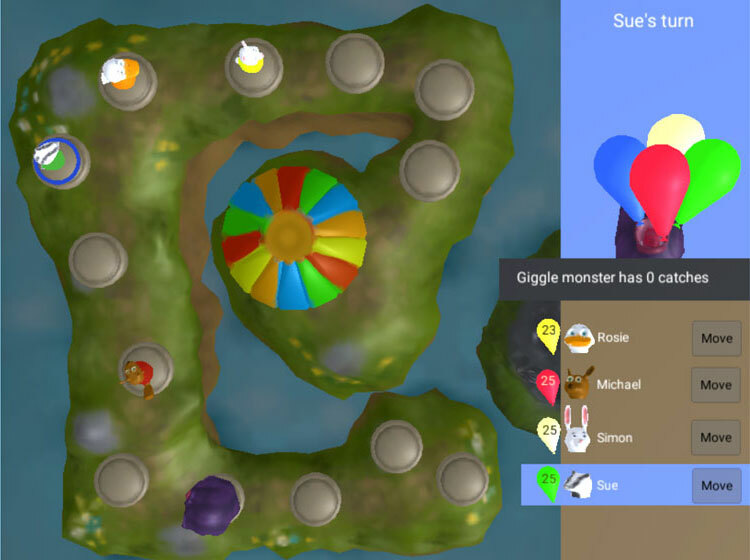 Based on the Experience API (xAPI) e-learning software specification, we developed an API for capturing information about skills demonstrated in prosocial games like The Chase. The activities and skills demonstrated by the students in the games are stored in a Learning Record Store and displayed via a Teacher's Dashboard that we developed in the project. 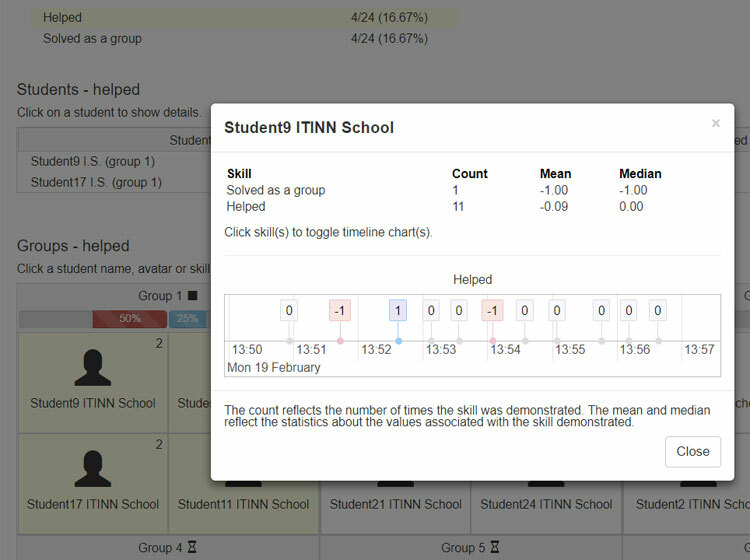 This dashboard allows teachers to view the status of groups playing a game in real-time, or afterwards. This provides teachers with opportunities for discussion with their students so that the skill development continues after the game play. The ProsocialLearn project was a 36 month project funded by the EC H2020 ICT framework programme. This project has received funding from the European Union's Horizon 2020 research and innovation programme under grant agreement No 644204.